A Winter Weather Advisory is in effect until 6:00 a.m. Wednesday, February 27, 2013. With possible snow accumulation of anywhere between 3 and 10 inches and forecasted temperatures just slightly above freezing, conditions can quickly move from mild to extreme. Village crews and equipment are prepared for whatever comes this way, despite the uncertainty of the predicted storm. 2/27/13 9:00 a.m. Main roads are clear and salted as of 7:00 a.m. Cul de sacs and dead end streets are 50% complete. All commuter parking lots are cleared and salted. 5:00 p.m. Plows are now shifting to secondary streets in order to facilitate traffic flow on main throughfares during rush hour. Snow operations willl continue throughout the evening and early morning hours. 3:30 p.m. Crews are working to keep major through streets safe for rush hour travel and will continue on to secondary streets thereafter. Commuter lots should have center lane clearance. Train station platforms will be cleared by the Village contractor, who will then move to clearing downtown sidewalks. Please, don't crowd the plow. Snowplows plow far and wide. The front plow extends several feet in front of the truck and may cross the centerline and shoulders during plowing operations. Don't tailgate or stop too close behind snowplows. 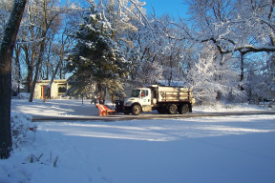 Snow plows are usually spreading de-icing materials from the back of the truck and may need to stop or take evasive action to avoid stranded vehicles. If you find yourself behind a snow plow, stay behind it or use caution when passing. The road behind a snow plow will be safer to drive on. On multiple lane roads, watch for snow plows operating in either lane. Don't travel beside a plow for long periods. When plowing through a snowdrift or packed snow, the impact can move the truck sideways. Snow plows can throw up a cloud of snow that can reduce your visibility to zero in less time than you can react. Drive smart. Never drive into a snow cloud- it could conceal a snow plow. Snow plows travel much slower than the posted speeds while removing snow and ice from the roads. When you spot a plow, allow plenty of time to slow down. Plows turn and exit the road frequently. Give them plenty of room. Parking on streets is prohibited between 9:00 p.m. and 6:00 a.m. when 3 or more inches of snow have fallen. It is against village ordinance to shovel, place, or blow snow or ice onto the street, sidewalk or any right-of-way. Please remember to be a good neighbor and shovel your sidewalk and any nearby fire hydrants, if you are able.